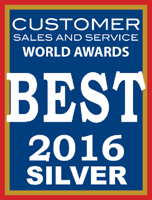 Salem, NH — May 15, 2016 —ConnectLeader, a leading innovator in sales acceleration technologies used by B2B sales reps to accelerate the sales process, announced today its ConnectLeader for Salesforce has been recognized as a Silver Winner in the Annual 2016 Customer Sales and Service World Awards®. The patented, Software-as-a-Service (SaaS) innovation was honored for taking the pain out of outbound dialing with easy-to-use, lead nurturing solutions: Click Dialer®, Personal Dialer® and Team Dialer™. The annual Customer Sales and Service Awards program, with active participation from a broad spectrum of industry voices, encompasses the world’s best in Sales and Service or Contact Center individuals, teams, departments, and achievements. Click Dialer™ - Click-to-call software residing within Salesforce.com that allows users to simply click and dial any phone number, take notes, leave a voice message, send email, and quickly move onto the next prospect. Personal Dialer® - Power dialing software that expands the Click Dialer features to allow users to seamlessly dial using a patented visibility and control capability while power dialing—improving sales productivity from 30% to 100% compared to manual dialing. Team Dialer® - An agent-assisted dialing solution that takes power dialing to the next level by allowing a group of human agents to make 125-150 dials per hour while filtering through non-productive dialing activities such as navigating voice mail systems, dealing with gatekeepers and leaving voice messages. Using Team Dialer, sales representatives are able to engage in 8 to 12 live conversations per hour with decision makers. To further enhance business lead generation, the company recently announced the availability of Adaptilytics™, a predictive intelligence engine, and Data Genie™, a data-delivery solution. Adaptilytics™ - A predictive intelligence engine that analyzes, prioritizes, and scores prospecting lists. This offering further improves outbound prospecting results by enabling users to customize the prediction algorithm based on a prospect’s installed technology, intent to buy, contact data and best time to reach. Data Genie® - An innovative data-enrichment solution that enables ConnectLeader users to add and update accurate contact data directly into their CRM. To learn how you can leverage ConnectLeader’s data intelligence and calling solutions to improve sales productivity, dial 800.955.5040 or email info@connectleader.com. ConnectLeader provides sales acceleration technologies for all types of sales roles to increase their top line revenue by increasing productivity from 10% to 800%. Our Intelligent Sales Acceleration platform gives sales, lead generation, and marketing teams powerful tools to identify the right prospects, obtain accurate contact data, and enable accelerated communication using our sales connectivity optimization and lead nurturing solutions. Beware, one size does not fit all! Successful business lead generation programs require different sales acceleration tools for different sales roles - our platform provides all of them. The patented cloud-based technology is built on the Adaptilytics™ predictive intelligence engine which identifies and prioritizes prospect lists ensuring your best sales leads are contacted first. Adaptilytics self-learns by analyzing more than 5 billion data points. For sales teams that want to enrich and improve CRM database ‘on-the-fly’, our Data Genie™ delivers accurate contact data and intelligence from third party data sources directly to your CRM system. To learn more about ConnectLeader’s innovations for B2B sales acceleration, visit http://www.connectleader.com. ConnectLeader, Adaptilytics, Data Genie, TopRung, Team Dialer, Personal Dialer, and Click Dialer are trademarks of ConnectLeader LLC. All rights reserved.